With health costs increase increasing at 4.4% in 2014, a slightly higher rate of growth than the 4.1% seen in 2013. While this is lower than the double-digit increases U.S. employers faced in 2001-2004, it’s still twice the rate of general consumer price inflation. That’s what the first graph shows, based on the The 19th Annual Towers Watson/National Business Group on Health Employer Survey on Purchasing Value in Health Care. Employers generally want to continue to provide health insurance…for the time being. 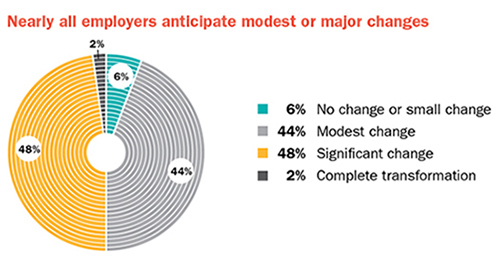 92% of companies expect to make changes in health plan provisions in 2014, with 1 in 2 anticipating “significant change.” That’s shown in the second chart, the pie. On the “Value” front, employers will continue to shift risk to employees and their families, changing their financial commitments to spouses in terms of higher contributions for family members and surcharges where other coverage is available. The key strategic choice employers are making to manage medical trend is offering account-based health plans (ABHPs) to workers, and enrollment in these plans is growing. Nearly three-fourths of employers in the survey have ABHPs in their benefit mix, and a further 9% will add an ABHP in 2014. The third chart shows the addition of 6.6 percent points to last year’s ABHP enrollment, reaching an average of 32.6% of employees enrolling in ABHPs at work, with nearly 18% of employers having 100% of workers enrolled in these plans. In 2015, nearly one-third of employers expect to offer an ABHP as the only plan option. Accountable- and value-based payment is now front-of-mind for employers with discounted fee for service waning from the health benefit scene. Value-approaches will permeate not only medical plans, but pharmacy benefits as well. As part of the migration toward value, more employers are looking for health care to be delivered in lower-cost settings where appropriate. Telehealth is seen as an important addition to the site mix for care, with one-third of the NBGH’s “high performing” companies now using telemedicine, and another 30% planning to offer remote care in 2015. Wellness programs are an important complement with ABHPs: companies are bundling incentives into wellness programs, with about 46% of employers incorporating incentives into wellness activities in 2015. This is a sign that more employers are embracing a company-wide culture of health. This report is a summary of the larger analysis which will be available in April 2014 from the National Business Group on Health. Health Populi’s Hot Points: With mass media outlets covering the “good news” aspect of health costs increasing the lowest rate in many years, it’s still a growth rate twice as high as inflation. Thus, consumers are being faced with allocating record amounts of household budgets to health care — second in line for family spend only to housing costs for the average family of 4 in America. The value-based era of health is impacting consumers as much as health providers and payers, as the consumer is now a substantial co-payer of the health tab. As such, transparency and tools that enable patients to take on their role as consumers are paramount. That’s on the financial wellness side of a person’s life-flow. 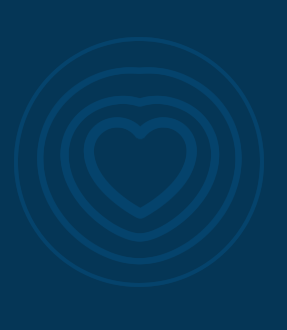 On the clinical side, people need tools for self-care: videos and engaging media that empower and inform people at home following a hospital discharge; help with nutrition for a newly-diagnosed diabetic, or bundling mental health tools for patients into primary care for doctors to be able to better manage depression and anxiety that often accompanies a new diagnosis of a chronic condition. As health providers continue to move into value-based payment, they are also entering a new era of risk management. Getting the patient and caregiver on the care team, armed with the right tools and sense of empowerment, can help to manage that risk.